It starts from the Village of Fumba a 20-minute drive from Stone Town. A full day sailing around mangroves and snorkeling along some of the best coral reefs Zanzibar has to offer followed by an exotic fruits lesson and the best seafood barbeque we have ever had! Suitable for beginners and more experienced snorkelers alike! A must do! You will depart from the village of Fumba in South West Zanzibar and we will take you to see the dolphins, sandbanks, islands and coral reefs of Menai Bay, a beautiful conservation area. Safari Blue is a full day trip and includes use of top quality snorkelling equipment with guides and instructors, ice cold sodas, mineral water and beer, a delicious Zanzibari seafood lunch with grilled fish and slipper lobster, gastronomic fruit tasting, coffee and Amarula liqueur. You will round the day off by returning to Fumba by traditional lanteen sail. In the morning you will set down on one of the beautiful sandbanks where one can relax, swim or snorkel. We have plenty of good quality snorkelling equipment and our experienced snorkelling guides will show you the pristine coral reef, which teems with tropical sea life. Instruction is also available for beginners. After snorkelling enjoy cold drinks, fresh coconuts and local snacks. After snorkelling we go to Kwale island where we have our "Desert Island" restaurant. The buffet lunch includes fish, slipper lobster, calamari, rice and sauces all served hot from the grill. Our crew also prepares and presents a gastronomic fruit tasting with a large selection of delicious tropical fruits. When the tide permits we explore the natural lagoon found on Kwale island. The lagoon is surrounded by a mangrove forest and we will take you swimming in the lagoon for an unforgettable experience. The dhows are traditional sailing boats, hand-built from African mahogany and finished to the very highest standards. They are comfortable and well equipped with outboard engine, VHF marine radios, gas inflatable life jackets, sunshade, boarding ladder, waterproof bags and first aid kit. We hold marine and public liability insurance. Safari Blue explores the Menai Bay Conservation Area, which is home to two different species of dolphins, the Indo-pacific humpback and the bottlenose. We are lucky enough to see dolphins on 85% of our excursions. Menai Bay has been designated as a Conservation Area since 1998 due to its outstanding natural beauty. The bay has a number of pristine sandbanks, naturally carved by the sea, wind and waves. The sandbanks and uninhabited islands that litter the bay are perfect stepping stones to explore the area. Join the crew for a sail on an "ngalawa"- a local canoe with outriggers which has been carved from a single mango tree. As Safari Blue comes to an end and we return by traditional lanteen sail, as the full splendour of the African sunset reveals itself. Morning we set down on one of the beautiful sandbanks where one can relax, swim or snorkel. There are plenty of good quality snorkeling equipments and the experienced snorkeling guides will show you the pristine coral reef, which teems with tropical sea life. Instruction is also available for beginners, fresh coconuts and local snacks are available through out the day. 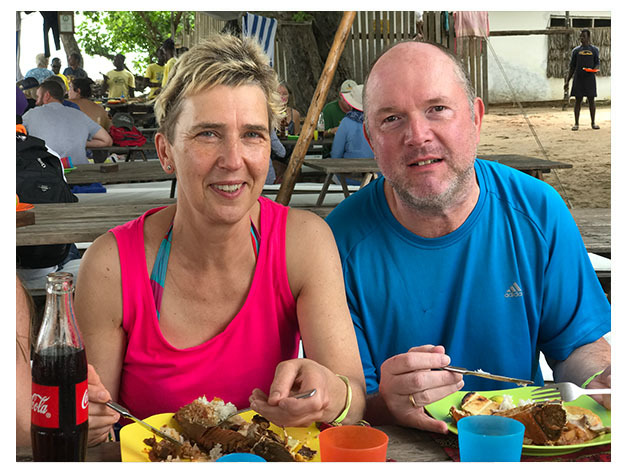 After snorkeling we go to Kwale island where we have our “Desert Island” restaurant. The buffet lunch includes fish, slipper lobster, calamari, rice and sauces all served hot from the grill. The crews also prepare and present a gastronomic fruits tasting with a large selection of delicious tropical fruits, ice cold sodas, mineral water and beer, a delicious Zanzibari seafood lunch with grilled fish and slipper lobster, coffee and Amarula liqueur. All type of drinks with Experienced English-speaking safari guide.